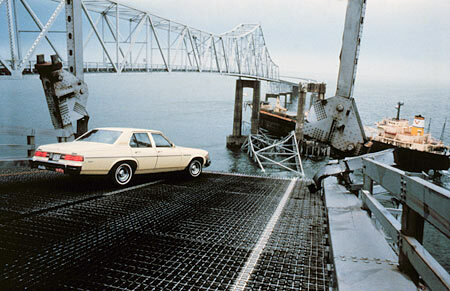 On the morning of May 9, 1980, the 606-foot long freighter Summit Venture (visible in the background) struck the Sunshine Skyway Bridge in St. Petersburg Florida, toppling the entire westbound lane. Here, we see a 1976 Buick Skylark that was carrying a group of retired men, which managed to stop a mere 14 inches from the edge. Several other motorists weren't so lucky. *One Greyhound bus, with driver and 25 passengers. *A silver 1980 Chevrolet Citation, carrying a couple from Pinellas Park. *A green 1979 Chevrolet Nova, driven by a man from St. Petersburg. *A sky blue 1980 Ford Granada, driven by a man from Tampa. *A yellow and black 1975 Ford sedan (model not named in the report), carrying a couple from St. Petersburg. *A tan and white 1976 Chevrolet El Camino, driven by a man from Seminole. *A silver 1979 Volkswagen Scirocco, carrying a couple from Pennsville, NJ. *A blue 1974 Ford Courier, whose occupant was the sole survivor among those who went over, due to the fortune of his truck actually landing on the deck of the ship. I bet that Buick needed new upholstery. But seriously, shame about all the fatalities. I didn't even know about this disaster, only that the old Sunshine Skyway was demolished for some reason (I was fascinated by various forms of destruction when I was a kid, and the Skyway featured in an article about controlled demolition in one of my childhood magazines). This accident lead to all bridges with elevated parts that span shipping lanes to have anti-collision bumpers installed to protect the structure. If you ever cross a major bridge like this, look down and you'll see them as huge concrete pillars, about 50 feet in diameter that are cast around the base so any ship that goes off course will hit them and not the bridge itself. This accident, and the later collapse of a bridge on the New York State Thruway around the time due to a flood washout (which also involved multiple fatalities) are two of the more famous freeway/infrastructure disasters in the US of that decade and lead to sweeping design and regulatory changes. #3, Some other shots of the salvaged vehicles in the slideshow this article. It appears the car identified in the report as a Granada was actually a Fairmont. And looking at the condition of the Courier, it's pretty surprising the old guy driving it survived. Appears to be the 1980 Citation on the right there. I had to ID it by the bumper bolt placement.